Prestige Parking Economy is a highly efficient Meet and Greet car park at Nottingham East Midlands airport. Save yourself time next time you fly by booking into a Meet and Greet airport car park, where someone else does the parking bit for you. 20 minutes before you arrive at the terminal, give Prestige Parking a call. Take a copy of your booking confirmation with you. Your chauffeur will meet you outside the terminal, and will give your car the once over to check for any damages, which will be noted down. Then all you do is swap your keys for a receipt and be on your way. Keep hold of the receipt for your return. Use the free phone in the airport arrivals hall to call Prestige Parking; just call the same number as before. A Prestige chauffeur will bring your car back to you outside the terminal, and will give you a pound coin to pay to get out of the parking area. Have your receipt ready, and your passport for ID. Add some sparkle to your airport parking package, and book a valeting service for a dazzling motor to drive home in! There are three different levels, Bronze, Platinum and Executive. Bronze valet is a hand wash, the Executive service includes a hand-wash, polished windows, cleaned and vacuumed upholstery, and the tyres and door shuts will be cleaned. Or, give your car a real birthday with the Platinum valet. The outside of your car, including the wheels, will be hand-washed and polished, the windows and all the plastic will be cleaned and polished, the upholstery and the boot will be shampooed and vacuumed, and the tyres and door shuts will be cleaned. Select your optional valeting package once you have confirmed your dates. 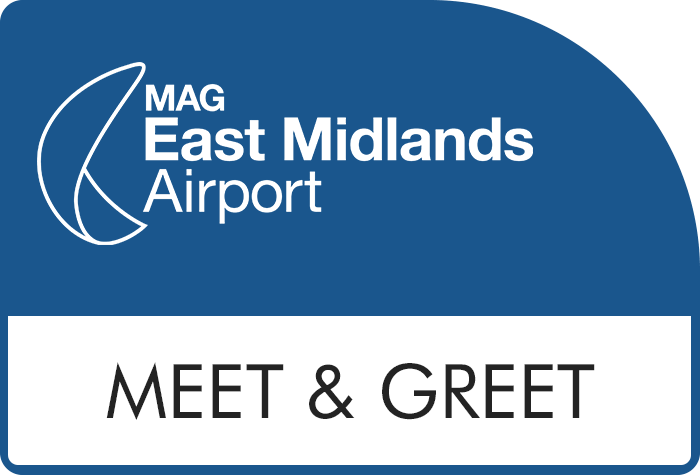 Meet and Greet is a great service for customers with disabilities, who would rather avoid having to catch a transfer bus or walk from the car park to the terminal. Your car will be parked within the airport grounds in Prestige Parking's secure car park. There's CCTV and staff on-site 24/7. Staff make regular security patrols and the car park is fenced and floodlit. The high security at this Meet and Greet car park has earned it the Park Mark award for safety, which is accredited by the police. No transfers are needed as you'll drive straight to the airport on your arrival, and your car will be brought back to the airport for you when you get back. Leave the M1 at junction 24 from the North, or 23A from the South, and follow signs for the airport. When you get to the airport, after the traffic lights, take the second exit at the roundabout, and follow signs for the rapid drop-off area. Follow the road right round until you're in front of the terminal, and park here. DO NOT park in the Meet and Greet area, or you may be charged.